Tag words: bacterial nutrition, bacterial growth, culture medium, selective medium, minimal medium, enrichment medium, synthetic medium, defined medium, complex medium, fastidious organism, aerobe, anaerobe, obligate anaerobe, facultative anaerobe, aerotolerant anaerobe, superoxide dismutase, catalase, psychrophile, thermophile, extreme thermophile, acidophile, alkalophile, osmophile, osmotolerant, water activity. Figure 1. Cross-feeding between Staphylococcus aureus and Haemophilus influenzae growing on blood agar. © Gloria J. Delisle and Lewis Tomalty, Queens University, Kingston, Ontario, Canada. Licensed for use by ASM Microbe Library http://www.microbelibrary.org. 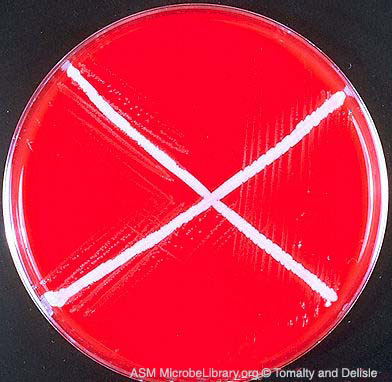 Haemophilus influenzae was first streaked on to the blood agar plate followed by a cross streak with Staphylococcus aureus. H. influenzae is a fastidious bacterium which requires both hemin and NAD for growth. There is sufficient hemin in blood for growth of Haemophilus, but the medium is insufficient in NAD. S. aureus produces NAD in excess of its own needs and secretes it into the medium, which supports the growth of Haemophilus as satellite colonies. Table 3. Common vitamins required in the nutrition of certain bacteria.